�����Norman Urann was born on December 14, 1918 at Sharon, Norfolk, MA. He was the son of Albert Harvey Urann and Catherine A. White. He joined the Navy the day after Pearl Harbor, he was originally planning to be a Marine, but the line was too long so he joined the Navy. After Boot Camp he was stationed at Squantum Naval Base, near Quincy Massachusetts. This is where he meet Mary Hamilton Jones, she was from Quincy. She had taken the civil service exam as she wanted to do something for the war effort, and got a job as a secretary working at the Naval Base, Her father allowed her to work there only if she agreed not to socialize with sailors. She was very obedient, and Norman asked her out repeatedly but she always said, "no", He found out her address and went to see her father and asked permission to take her to dinner, he liked him, and agreed that it was okay. They were married at the Catholic Church in Quincy on April 10, 1944. In early 1945 Norman received orders to report to the Navy's newest ship, the USS Skagit. Mary attended the commissioning at the Brooklyn Navy Yard on May 2, 1945, and Norman became a Plank Owner. While at sea he suffered an appendicitis attack, the ship's doctor was an eye and ear doctor, but managed to take out the ruptured appendix nevertheless! 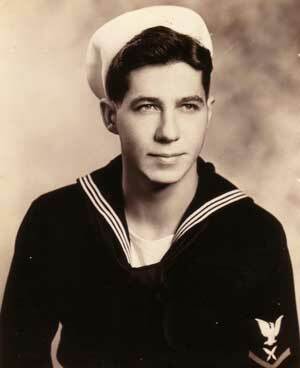 Norman finished out his Navy tour aboard Skagit , and was released from duty at the end of the war. After the war, he worked his way up with General Motors, and then became a Cadillac/Oldsmobile dealer in upstate New York, but sold that business and moved back to his home town of Sharon, Massachusetts. He then became the treasurer of a chain of small hotels, including the Essex in Boston. He was still working in September 1985 at age 67 when he had a heart attack and passed away. Though not an active member, Norman wandered down to the VFW and American Legion hall occasionally to meet with other Vets. Norman had 5 children and 9 grandchildren.